Help the DJ to choose his discs. Choose the plate where to place the cd's then send the cd to the plate with the same figure. Help Dec sort his disks. Use the left and right arrows to mhove the cursor and then hit the space bar to throw a disk. The aim of the game is to throw disks onto their matching stacks. Left / Right Arrow Keys - Choose the plate. Spacebar - Send the cd. Every time you throw a disk onto the corregt stack the combo meter increases. Disks are worth more points when the combo meter is high. If you throw a disk onto the wrong stack then the combo meter drops to 1. 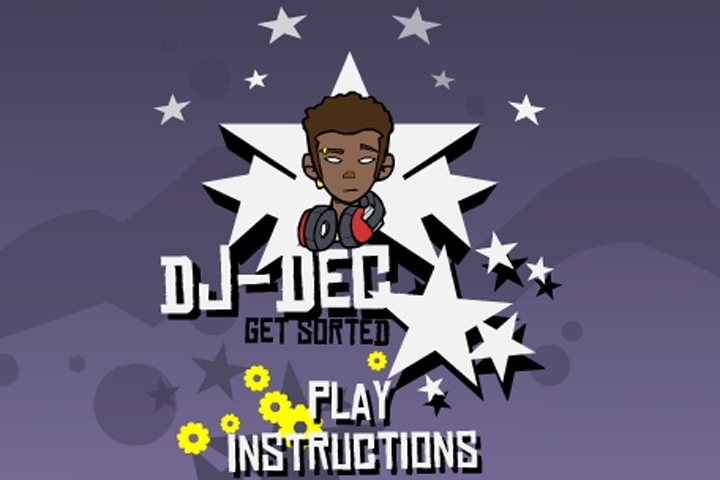 If you want to play DJ Dec Get Sorted games online you have come to the right place! GamesLoon adds new DJ Dec Get Sorted games every week. This is your game portal where you can find the biggest collection of free DJ Dec Get Sorted games online. Do not forget to rate our DJ Dec Get Sorted free online games while playing!